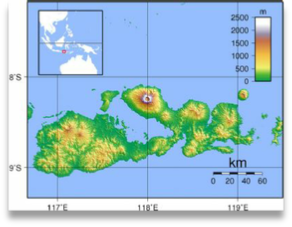 Tambora is a strato-volcano located on the island of Sumbawa in Indonesia, forming the Sanggar peninsula of the island. The island is part of a very active volcanic arc, which is part of the Ring of Fire around the Pacific Ocean. On the 5th of April, 1815, after lying quiet for over 5000 years, the first eruption began, lofting a volcanic column 15.5 miles (25 km) into the sky. This initial eruption was heard over 621 miles (1000 km) away. On April 10, 1815, a series of eruptions began, culminating to the largest eruption in recorded history. The eruption lasted several days. It blew a chunk off the mountain almost a mile wide. The volcanic column, after flying 25 miles (40 km) into the sky, returned to the ground, creating a huge pyroclastic flow of ash, pumice, and debris. The pyroclastic flow alone killed more than 10,000 people in its path. The ash that fell from Tambora travelled as far as 800 miles (1300 k) away. When the pyroclastic flow reached the ocean, the debris created such a large displacement of water that tsunamis as high as 16 feet emanated out from the island. These tsunamis caused flooding, devastation, and death on many of the other Indonesian islands. After the eruption was over, and estimated 100-150 cubic kilometers of ash and debris were said to have been ejected from the mountain. [for reference, in 1980, Mt. 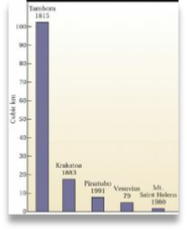 St. Helen's ejected about one or two cubic kilometers]- see graph right. Volcanoes are measured by a Volcano Explosivity Index (VEI), on a scale of 1-8. 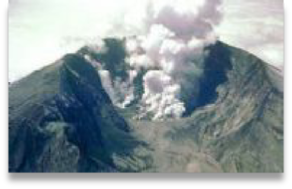 Tambora had a VEI of 7. 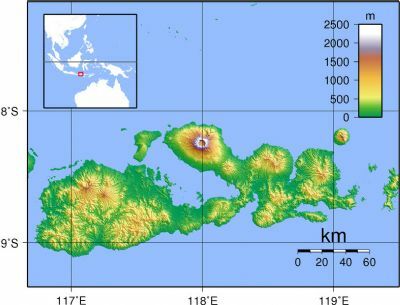 Only 4 other volcanoes in the last 10,000 years have had a VEI that high, and Tambora is the only volcano in recorded history with a VEI of 7. The giant crater left at the top of the volcano 4 miles wide and 3,640 ft. deep, a hole that is still quite obvious today. The ash that fell from the eruption at Tambora was devastating, killing all the crops and vegetation, causing more than 80,000 more deaths from famine and disease. 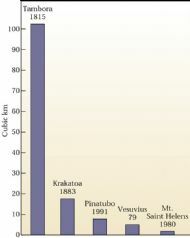 This death count is the largest from any volcano eruption in recorded history. In addition, the amount of sulphur dioxide that was released into the stratosphere made 1816 the year without a summer. In 1816, the overall temperature on Earth, specifically in the Northern Hemisphere, lowered so drastically that it became known as the year without a summer. Weather was disturbed all over, with problems in Western Europe and the United States, as well as Asia. Monsoon season was affected, which is thought to also be tied to a cholera epidemic that year. In places like New England and Canada, frost was recorded in every month of the year, and snow fell in June. The summer temperatures in 1816 averaged just a few degrees below normal, but as mentioned, it frosted throughout the summer. The highs were still close to 100 degrees Fahrenheit on some days. 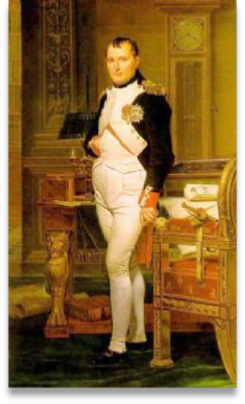 However, the cold spells, especially at night, caused massive crop failure, and, as a result, even more famine. Why? 200 million tons of sulphur dioxide was shot up into the stratosphere. The sulphur dioxide prevented much sunlight from reaching the Earth’s surface, lowering the overall temperature, and killing crops and many creatures as a result. This crop failure caused mass famine, which was what caused the death toll to be so high. The global changes in temperature did not occur until a year later. This delay was due to the fact that the stratospheric winds take that long to distribute the sulphur dioxide and volcanic ash all around the world. After the end of the Napoleonic Wars those British soldiers who survived found an economic crisis at home and very few jobs to return to. To make matters worse, in 1815 the British Government passed the Corn Laws, which levied taxes on imported grain in order to protect the interests of the landowners. Wheat was in short supply following several bad harvests, and the price of bread became prohibitive for the working classes. At this time all responsibility for poor relief fell on the parish authorities; the Speenhamland system, dating from 1795, was a ‘top-up system' based on the price of a loaf of bread and the number of children in the household. In practice wages of those in work, especially in agriculture, tended to remain low, as employers left it to the parish authorities to augment starvation wages. 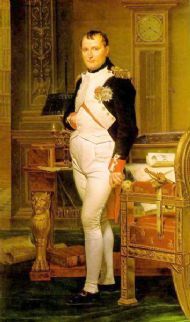 The French Revolution inspired reformers in Britain as much as it frightened the British Crown and landowning classes. It is worth remembering that the Hanoverian dynasty, which provided Britain with its monarchs from 1714 to 1901, was only rarely popular, and was frequently criticised for its lack of understanding of the British people. Anti-government cartoons in the 1790s often included the most scabrous, even treasonable, representations of King George III. In that decade, a number of political movements emerged to press for parliamentary reform. Some, like the London Corresponding Society, were organised and directed by skilled craftsmen and depended on the support of working people. 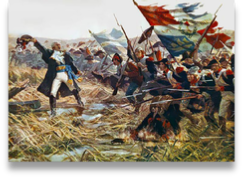 They embraced political objectives drawn directly from French examples. They wanted to replace royal and aristocratic rule with representative government based on the Rights of Man - the influential political pamphlet by Thomas Paine. 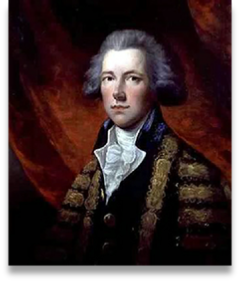 From 1794, radical political leaders could be arrested without trial. 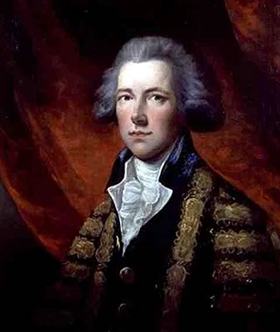 The government of William Pitt the Younger, already at war with revolutionary France, was thoroughly alarmed by the prospect that revolutionary ideas might be exported to Britain, and it responded to these ideas with political repression. From 1794, radical political leaders could be arrested without trial. In 1795, during a period of high food prices and severe public agitation, stones were thrown at the King's carriage as he went to Westminster to open a new session of parliament. In the fevered atmosphere of the time, such actions could easily be interpreted as portending revolution. 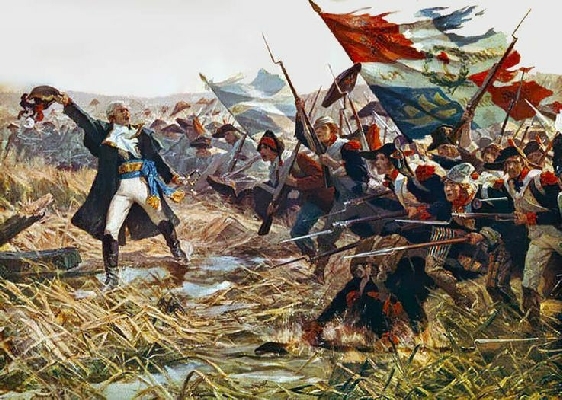 Within weeks, a parliament dominated by fearful landowners had passed legislation that redefined the law of treason, and that made it almost impossible to hold public meetings in support of reform. 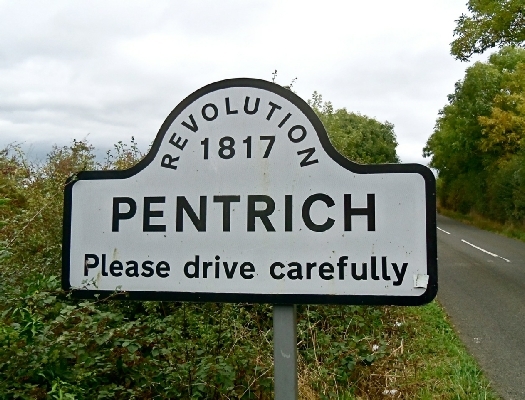 By 1817 the Industrial Revolution was gathering momentum and the population was growing, especially in urban areas. With the increase and movement of population the government was no longer representative of the people. Reform was being sought as the growing industrial areas of Leeds & Manchester had no MP’s to represent them and Cornwall had 44 MP’s. 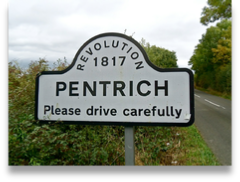 Thomas Bacon, a war veteran and Framework knitter living in Pentrich, was active in the reform meetings. 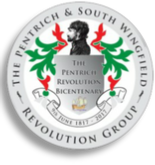 He travelled to various reform meetings around the Midlands and the North and reported back that an insurrection was planned, men from Yorkshire, Nottingham and elsewhere were planning to march on London and overthrow the government. After the march the call for reform was temporarily silenced and it was to be almost 20 years before reform was achieved. 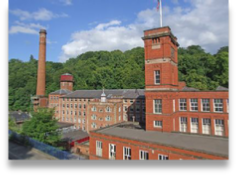 Cromford Mill was Sir Richard Arkwright's first and most important cotton mill, at which he pioneered the development of his water frame spinning machine and revolutionised the manufacture of cloth, thereby laying one of the cornerstones of the Industrial Revolution. Arkwright began his career in the Nottingham area, but in 1771 he and his partners moved to Derbyshire to take advantage of the potential water-power available from the streams and rivers there. Cromford was chosen and the water from Bonsall Brook and Cromford Sough (a lead-mine drain) were utilised. 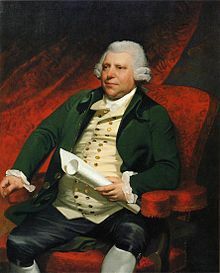 A disadvantage of Cromford was poor communications and it was not until the opening of the Cromford Canal in 1793 that Arkwright had a cheap and easy way of transporting both raw materials and finished goods to and from the site. The first mill here was built in 1771 and a further one added in 1776. 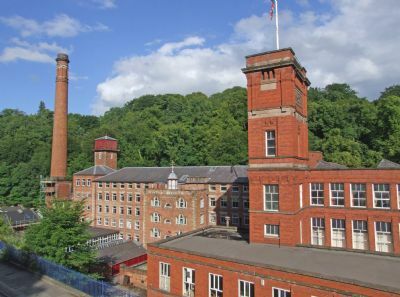 Arkwright developed further patents and the mills were extended until 1791, when they reached their greatest extent. By 1840 the mill was out of date and had been overtaken by the steam-powered mills in Lancashire and the Masson Mill upstream. The second mill was burnt down in 1890 and only the original mill survives, along with some secondary buildings such as the Counting House. This newly mechanised industry replaced the old trades of the framework knitters and the metal workers whose trades had already been cut by the returning of the troops, they no longer had to produce the uniforms and weapons for the Military and Navy, this in turn caused the wages of skilled workers to drop and working conditions began to deteriorate.